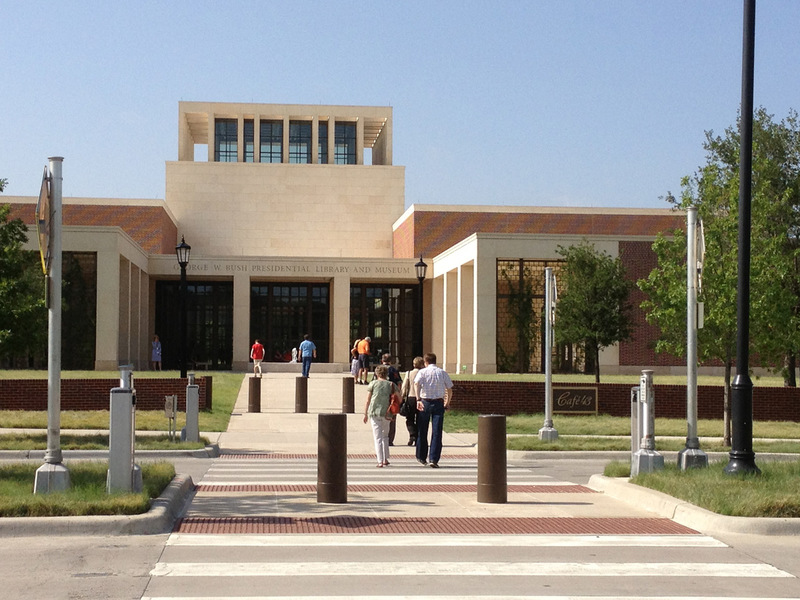 Never having visited a presidential library, I had no idea what to expect. Since I was not enchanted with the “W” Bush presidency, I did not approach this adventure with my usual zeal, but my curiosity was piqued. And although I do recommend this visit, I do it with a heightened sense of the import of history and admiration for all who assume the burden of leadership. The building is magnificent. Opened only about 6 months ago, it is practically part of the SMU Campus. In the lobby, there are showcases of gifts given to the Bushes and to the American people during the Bush presidency from foreign leaders. Some of those items are over-the-top, like the jewelry and statuary, particularly from the oil producing nations of the Middle East. And some are almost pathetically anti-climactic, like the little clay bohio presented by the First Lady of the Dominican Republic. 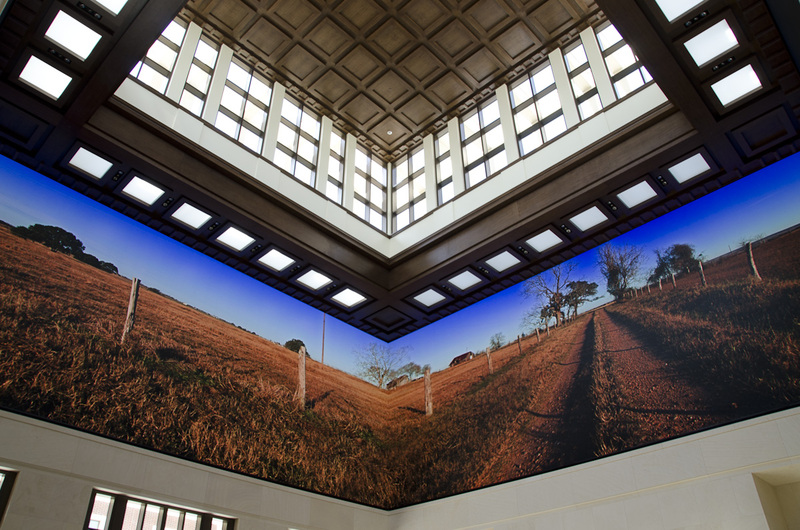 Two walls of the 360 degree video screen. Impressive! Just behind the lobby is an interesting room with four TV screens covering all of the wall space above the cornice of the room and on which plays a magnificent 360 video of scenes of the United States. That is a definite don’t miss, and I think to really appreciate it you’ll want to watch it through twice, changing your position in the room. There are plenty of family pictures of both the former president and Laura Bush, but the bulk of the museum is dedicated to the events of the eight years of his presidency, right from its difficult beginning with the vote recount in Florida. Being the president of the United States cannot be an easy job nor one that anyone could take easily. Reliving the events of his eight years in office, there are exhibits on September 11th and Katrina, as well as the hunt for Saddam Hussein and the war on terror. We saw the origins of No Child Left Behind, of the faith-based charity initiatives, and of Laura Bush’s reading program. Of course there is much more. As you walk through the exhibits, read the descriptions, watch the videos, and admire the photos – the idea that George W. Bush’s legacy will be his acting consistently with his values is evident over and over. A future President and First Gentleman? Portrait in the Oval Office. It is not all serious, though! There is a whole section of the exhibit dedicated to the White House. 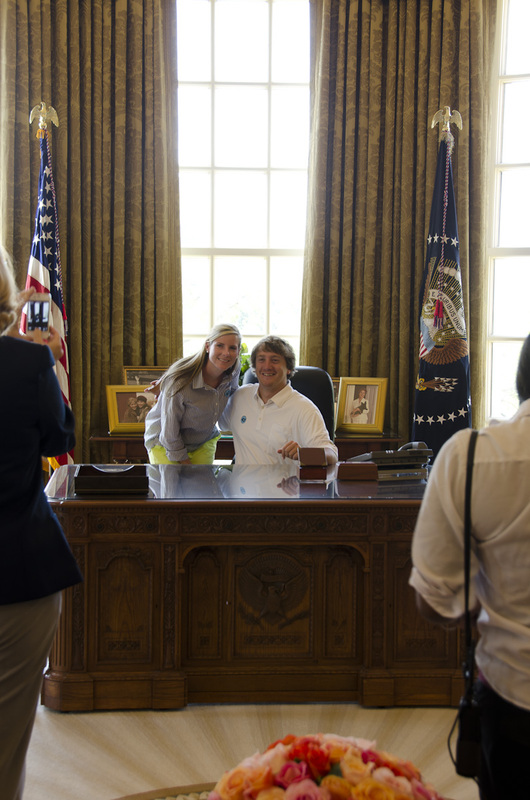 You can sit in the president’s desk in the oval office and have your picture taken. There are interactive screens for playing games with White House themes. You can see a photo album of the White House staff. You can even see letters written to the First Dogs! There is also a bookstore for fans, with plenty of souvenirs, and lots of books. For the particulars, know that we bought our tickets online for a 10:30 entrance. I am not sure how the timed entrance worked, maybe just a psychological way to control the flow of people because they did not ask for that information when we arrived. The museum was crowded, and we did have to jockey with lots of other people to see some of the exhibits. Despite the crowd, it took us a little over an hour to see everything that was open. (There is another exhibit space for travelling exhibits that is not ready yet.) Click here for the website address. At the end of our tour, I found a plaque talking about the George W. Bush Foundation. It was quite a surprise to me to see that part of the mission of the Foundation is women in leadership! Click here to read more about that!